The sheetlines are rather unkind to Eton, cutting right through the College Cloisters, but we have double-sided this detailed map to provide good coverage. The main map covers the centre of the College and the area westward to North Field, Eton Great Common, South Field; beyond is Eton Wick, with St John the Baptist church, which became a civil parish in its own right in 1894; also Eton Cottage Hospital, and New Town. In the SW corner is Windsor Race Course with grandstand. In the town Barnespool Bridge and part of the High Street are shown, as also Folly Bridge, cemetery, St John's church, gas works, Science School. On the reverse is over half of adjacent sheet 56.06 covering the eastern part of the College, Fifteen Arch Bridge, Beggar's Bridge, Eton College Laundry. To the NE is the hamlet of Mirk and the southern fringe of Slough, including Upton Court and St Lawrence's church. In the south is part of the Public Recreation Ground, with the LSWR Windsor line looping through across the Thames. 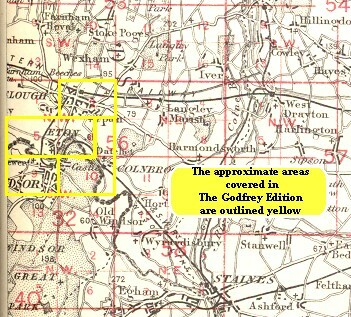 The map links up with Bucks Sheet 56.02 Slough to the NE and the Berkshire Sheets for Windsor to the south and east. This index map shows how they link up.